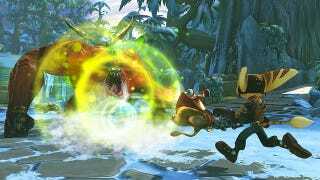 Full Frontal Assault, the next release in Insomniac's Ratchet & Clank series, will be out just in time to turn the holidays into a cartoony sci-fi frag fest. The downloadable title is going to cost you $19.99. For that price, you get the game for both PS3 and PlayStation Vita, with cross-play and cross-save across the two devices. This latest Lombax-and-robot title adds tower defense elements and beefs up the multiplayer, too. All the Insomniac talk has been focused on Fuse of late, so this game should be a good way to remember that the dev studio does good work no matter what a game's art style looks like.